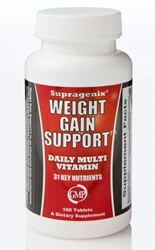 New Supragenix Weight Gain Support Multivitamin provides 32 essential vitamins and minerals to support the demands of rapid weight gain. Our Weight Gain Support Multivitamin provides the vitamins and minerals that the body needs to support the rapid weight gain process. CB-1 Weight Gainer announces a unique weight gain multivitamin to add to their weight gain product line which also includes a weight gain pill called CB-1 Weight Gainer. The Weight Gain Support Multivitamin is a once a day, smaller than normal multi-vitamin tablet that is taken with a meal. The 100-tablet bottle can be purchased by calling 888-528-5551 or visiting http://www.cb1weightgainer.com. Alvord says the Weight Gain Support Multivitamin is different from most multivitamins because it has a complete line-up of 32 different vitamins and minerals, including several trace minerals like boron and nickel that most multivitamins leave out. He also says it’s formulated to be high in vitamins and minerals like zinc and iron that are essential for healthy appetite so it’s the best multivitamin available for supporting your body’s needs as you quickly gain weight. The company says they want to continue to help the people who struggle with a fast metabolism and weak appetite so they plan to continually improve their current weight gain formulas and to add new products to their CB-1 Weight Gainer product line.